Lazing around for the summer? Not!!! It’s Sunday morning and I have done it again. I have lapsed for weeks since my last post. Yes, I have been bad. Well, there’s been a whirlwind of stuff going on since we returned from the Bahamas. How I long for the lazy days with not much to do. I won’t talk about how big my lawn is but let’s say that it takes more than one bag of fertilizer to cover it with one application. Enough said. Anyway, since my last post we successfully had a great SSCA (Seven Seas Cruising Association) rendezvous with nearly 60 in attendance and some coming by boat from as far away as VA. And, that’s not including folks like us that had spent their winter in the Bahamas and came to Essex on their way to Maine. This event is one that we have been having annually and will continue doing here going forward. We hope to have 100 attendees in June of 2015. We had a number of terrific speakers over the three days of the event and I’ll be writing about one in particular, a sailor who performed an at-sea rescue last year in the Bermuda 1-2. His talk was very moving and I expect to write about his amazing story soon. Beyond spending time on this event and all that led up to it, I was also studying for my HAM radio Technicians exam, which I passed. YEAH! I have very much wanted to have a HAM license since getting my SSB radio a few years ago and it feels good to have passed it. I read the book, a number of times, over the winter (during those not so busy days aboard) and studied like mad for a few weeks prior to the exam. Now I’ll be studying for the next level. I expect to take the next exam in Annapolis at the SSCA September Gam. Wish me luck. I also decided to GIVE UP on my MaxProp, which has given me fits for as long as I have owned Pandora and sprung for a new Autoprop. My MaxProp has been rebuilt TWICE in just a few years and I was still getting vibration in the drivetrain. Yes, I have written, and whined, time after time about this so finally I said “ENOUGH” and purchased an AutoProp. 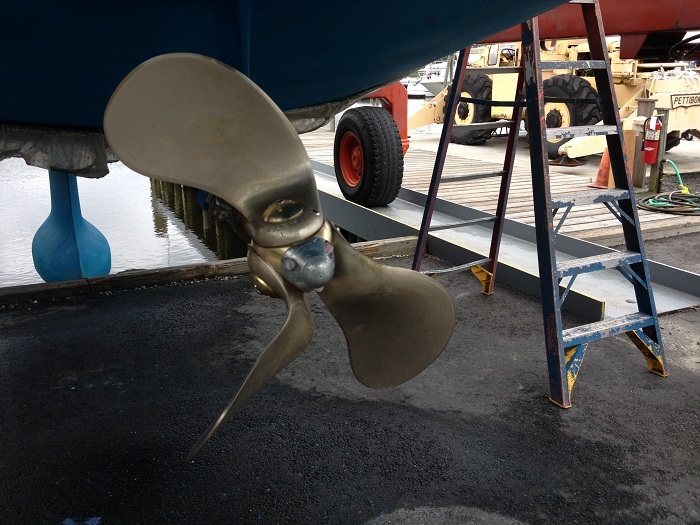 It’s a very odd looking propeller with three blades that each can spin 360 degrees on the hub. For the life of me, I can’t imagine how it works. Beyond that, I can’t fathom how someone even thought of the idea. However, I have a few friends with one and now that it’s installed, WOW! It’s amazingly smooth under power and I have gained more than a 10% efficiency in speed. That’s sort of like getting a 10% discount on fuel I guess. 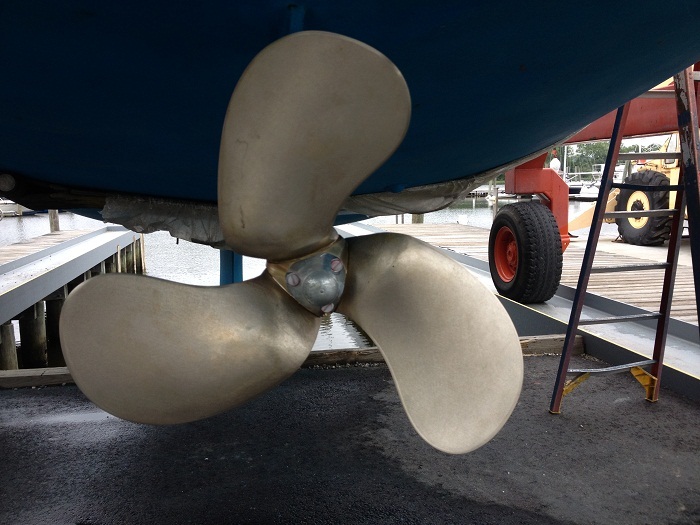 Anyway, I am also told that the pitch of the propeller adjusts automatically as the boat speed and sea-state changes. I am very much looking forward to seeing how it works in various conditions. I’ll find out soon as I am leaving for New Bedford today. More about that soon, read on. Anyway, here’s a photo of the AutoProp installed and in “normal” operational mode. Looks normal, right? 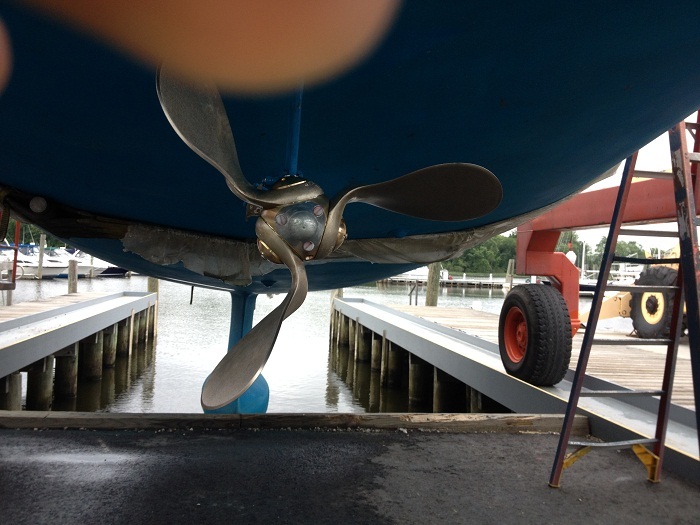 And, when you stop the engine, the prop blades rotate a bit and go in line with the water going under the boat. Normal again… However, the weirdest part of all is how the bladed can flop around at at random when the boat is sitting still. Now that looks very odd. It’s hard for me to imagine just how things line up and work when the blades can orient themselves any which way. However, it works and the actual blade alignment changes based on the RPM of the engine and the pressure on the blades. I guess it’s like a thermos keeping liquids hot or cold, “it just knows”. Happily, the propeller vibration problems are now history and Pandora will surely be happier now when the engine is running. Me too. So, what’s next? As I wrote about a few weeks ago, the Charles W. Morgan whaling ship is in New Bedford for a few weeks and I am going to head up there to see her. It’s been nearly 100 years since she last called on that port, when she was an active whaling ship and it will be fun to visit. 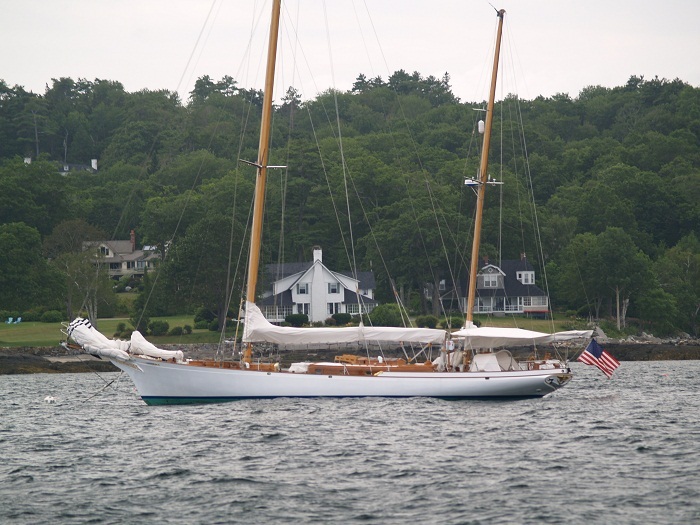 This video is of her leaving Mystic Seaport where she’s been since the 1940s. Here’s a video of her sailing for the first time in 90 years. I expect that you will agree with Brenda that it’s about as exciting as watching grass grow. Well, wait a minute, this surely isn’t something that you see every day. Right? But don’t fear, it’s only 1.5 minutes. You can handle that I hope. My good friend Patty has a house on the water in New Bedford harbor and has offered for me to put Pandora on the mooring for a bit. So, today my friend Burt and I will make the run from the CT River to New Bedford. It will be good to put Pandora back in commission and sailing again. So, I hope that you are convinced that I am not a slug lounging around in my lawn chair and shirking my “blog post duties”. I have been busy, indeed. Now it’s time to do a bit of sailing. Perhaps I’ll close with some historic footage of the Morgan back in 1926, surely a simpler time. Camden, a “Maine” favorite for Pandora and a bit of whining. It’s Thursday morning here in CT and it’s cloudy, again. After a winter of SUN in the Bahamas, I am amazed with how cloudy it’s been here in the last few weeks. We have been trying to find a few days to head north to Vermont to celebrate our 37th wedding anniversary (Yes, I know, we look like two kids just playing house. 37 years? I wish we looked more the part too.) Anyway, the weather has been cloudy more often than not. We’ll give it another try early next week. Who wants to head out on a “mini-vacation” for a few days in the rain? Not I, no make that Not We. Well, wish us good luck and a few sunny days. However, June is nearly half over and I am NOWHERE toward getting Pandora in shape to do a bit of cruising this summer. As I have moaned about to anyone who would listen over the last year or so, I have been frustrated by an ongoing vibration problem in the running gear on Pandora. It seems that we have vibration that comes and goes and I am about out of ideas as to how to correct the problem. Last summer I sent out the Max Prop for rebuild, it’s second visit to the manufacturer, because of vibration problems. Unfortunately, this did not solve the problem and after getting the engine aligned and having the prop shaft tweaked a bit, the problem just won’t go away. No, make that, the problem won’t stop and sometimes happens and as quickly goes away as the vibration is intermittent. In any event, I decided “enough is enough” and ordered another type of propeller, this time an Autoprop. First, here’s a video of the Max Prop (the one that has been giving me fits), an elegant piece of machinery if there ever was one. Don’t worry, the video is only about 30 seconds. However, be warned that the “speaker” isn’t going to get an Oscar for his delivery. In concept, this prop is a wonderful piece of equipment. However, it needs a fair amount of ongoing maintenance as it has to be filled with grease three or four times a year. And, unless you are an occasional cruiser that hauls their boat at least once a year and doesn’t put many miles on it, this means swimming down under the boat with a grease gun to get the job done. And, if all was well and the prop ran smoothly, I’d be ok with that. However, after years of frustration, Max is Min for me so it’s time for a change. So, what to do? A number of fellow SAGA 43 owners have spoken highly of the Autoprop and after fussing with my current prop for several years, I have ordered one of these. The reason I waited as long as I did is that these puppies are pretty pricey and spending that amount of money for something that I can’t even see has kept me focused on trying to make my Max right. However, after a winter of nursing it some 4,000 miles I decided “enough already, it’s time to make a change”. Just for fun, here’s a video of how the Autoprop works. It’s a very odd looking beast. I sure do hope that the effort, and cost, of pulling Pandora out of the water to make the switch proves to be a good decision. For sure, it’s an expensive one. Fingers crossed that I am not just swapping one set of problems for another. Ok, enough about “what doesn’t work”. How about I talk about where I want to be? Yes, that’s good. 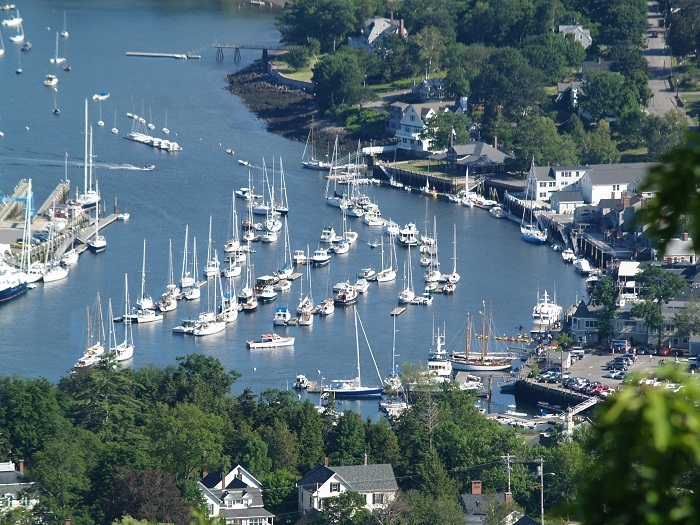 How about Camden Maine? Yes, that’s a good spot. 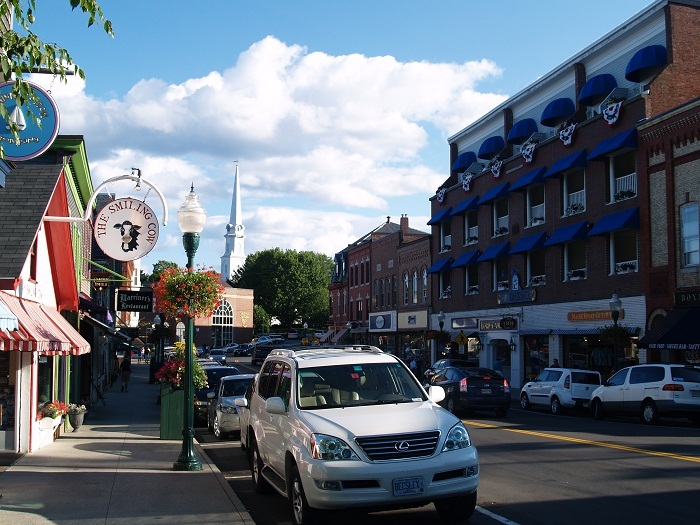 Camden Maine is located in the heart of what is referred to as “Mid Coast Maine”, on the western shore of Penobscot Bay. 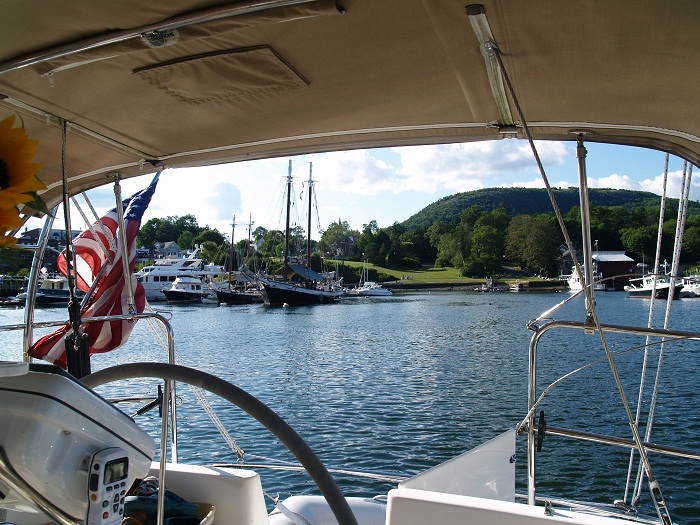 This body of water is one of the nicest cruising areas in Maine and a great jumping off point to explore other ports, all within an easy day sail. Whenever we head to Maine our visits always include a stop in Camden where we enjoy taking a “harbor float” within the “inner harbor”. The main harbor is very nice but it’s somewhat exposed to the prevailing SW winds so any boat in the harbor is subjected to what is known locally as the “Camden Roll”. Unfortunately, there is nearly always a bit of swell finding it’s way into the harbor so enjoying a quiet evening aboard isn’t always as quiet as it should be. Fortunately, there’s a way to avoid that and that’s to tie up to one of the small floats in the tiny inner harbor. We generally take one of these floats from the Camden Yacht Club as they charge a bit less than the commercial yard that owns the bulk of the floats, Wayfarer Marine. 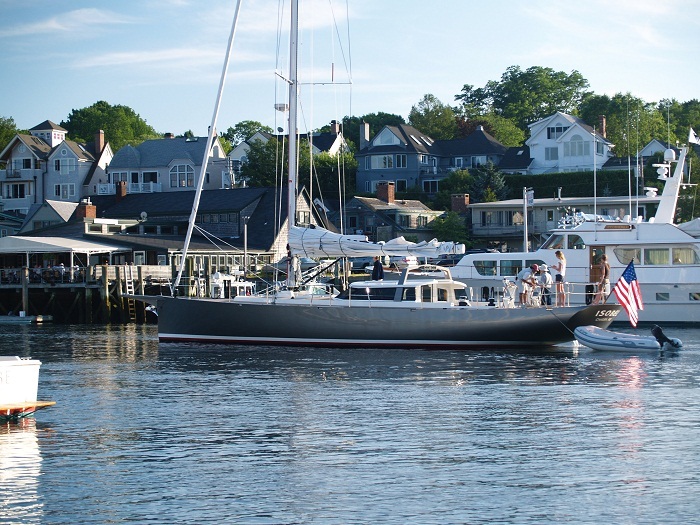 Both operations are very friendly and when all of the CYC floats are in use, we just go with one from Wayfarer. One way or the other, being in the tiny inner harbor is a great spot. Actually, it looks bigger from up high than it seems when you are there. As you can see, the harbor is filled with small docks all moored in a line. It’s a great way to pack a lot of boats into a small harbor and very orderly. Here’s a view of the harbor from high up on the nearby Camden Hills. You owe it to yourself to take the hike up to the summit to see this view for yourself. As if the view from the top isn’t enough? The view from Pandora, just as nice. What a spot. Just to our stern in the shot above is a dock used by some of the local schooners who take folks out for a week of sailing. Going out on a “dude schooner” would be a real treat? Want to learn more? 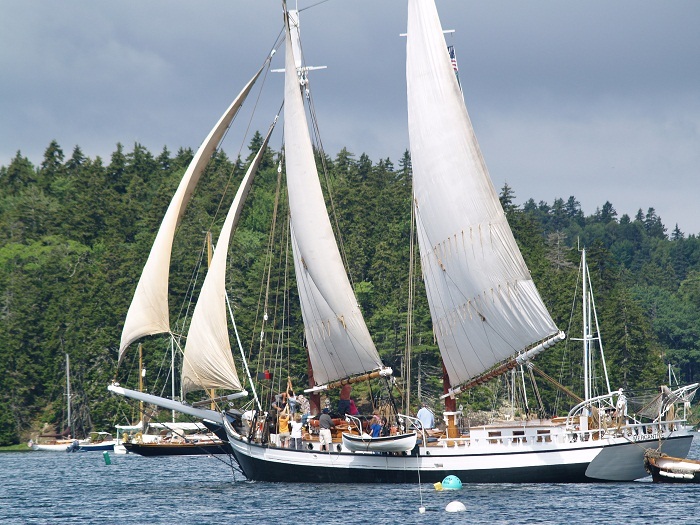 Visit the schooner association website. These majestic beauties are one of the real treats of a visit to Maine and Camden. To see these boats sail into a harbor at the end of the day is breathtaking. And they have to sail as they have no motors. It’s a good thing that the captain and crew are well seasoned on sailing in close quarters. Pretty impressive boat handling. Me, I prefer to anchor under power. Ok, call me a wimp, I can take it. “Bob, you’re a wimp”. See, I didn’t even flinch. Well, only a little. And if you are one of the 1% you might want to have one of these. Not into varnish and old wood? Perhaps this beauty is more your style. And yes, 1% club member, for sure. However, if you are carry a AMEX Black card and are a member of the .0001% club you can have a boat like Bystander. 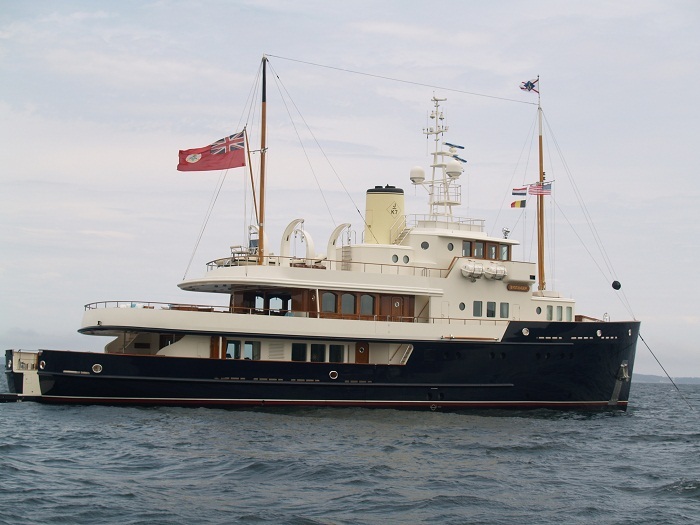 Bystander was built in 2007 and was designed to look like a classic steamship from the 30s. This article will give you a feel for what she’s like. Now, that’s real money. 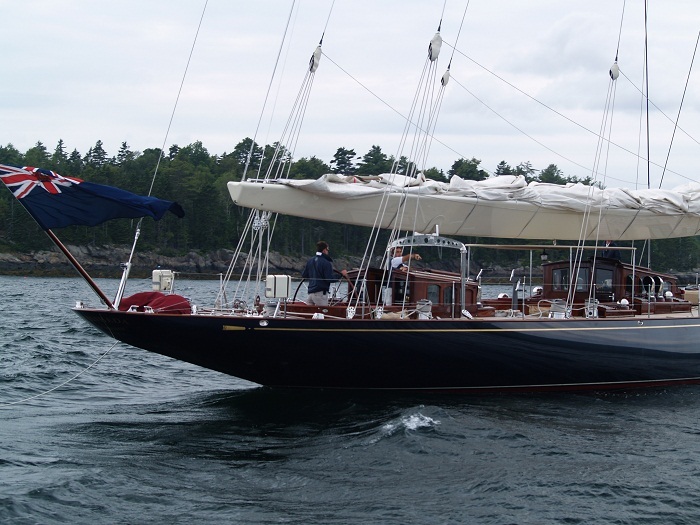 This spectacular ship is privately owned and acts as a “tender” to a magnificent classic “J” yacht Velsheda, once a contender for the America’s Cup trophy. This classic sailing yacht has been “rescued” several times from near death to be rebuilt. She has an interesting history chronicled here. She is now in fit condition, probably better than new, a perfect example of what an open, and unlimited, checkbook can accomplish. To own a classic “J” is not for just anyone. However, he’s not alone as there’s a “bakers dozen” of these beauties around now, more than were sailing in their heyday. Check out the “club site” for an overview of all of the current Js. Talk about an exclusive group. It’s amazing that one person can own a classic J along with a remarkable power yacht like Bystander. Well, these are just a few examples of what you can find in Camden. Even if your bank account isn’t up to owing a multi-million dollar yacht, you can always go ashore and drown your sorrows in a bowl of ice cream. Yes, that works for me. Besides, what visit to this lovely town would be complete without a stroll down the main street, another reason that Camden is indeed one of Pandora’s favorites. Warm summer days, cool nights, beautiful views, a chance to watch the folks with “giga-money” having fun and ice cream. What’s not to like? Perhaps if I finish this post I can get dressed and get to work on Pandora so we can go sailing again. Now that’s a plan. Oh yeah. Thanks for listening to my whining. I feel better now too. Allen Island, summer home of the Wyeth clan. A Maine Favorite. It’s Friday morning and I am feeling a bit guilty for not posting for nearly two weeks. My goal, when we are “on the hard” is to post at least once a week. However, I do find inspiration somewhat difficult when I am not out on the water. Well, I’d better get over it as shoreside is where I’ll be for a bit. The good news is that later this month Pandora will be in New Bedford to celebrate the arrival of the Charles W. Morgan, the whaleship from Mystic Seaport. New Bedford was the Morgan’s home port when she was an active whaler and this return visit will be her first since the 1940s. After millions spent on her restoration over the last few years, this visit to New Bedford, for the Morgan is a big deal. I’ll certainly be writing about this later in the month. Stay tuned for that. However, right now, Pandora is sitting patiently in her slip in Deep River with sails off and out for repair. Speaking of self inflicted damage, Yes, an awkward segue, I know, I was shocked and more than a bit embarrassed to discover that I had furled the genoa on backwards, at least a year ago. What I mean is that the sun cover, designed to protect the sail cloth from UV damage, was furled on the inside of the sail instead of being on the outside. As a result, some damage was done to the leech of the sail. It’s being repaired but I feel like a jerk making that mistake. Oops. Well, the sails will be back in good shape soon. All it takes is $$ to make things right. Oh well…. How about something about moving around, no make that cruising on boats. Yes, that’s much better. As I mentioned in my last post, I will be writing a series of “favorite places” over the next few months. Hopefully, I will be visiting some of them again soon but for now I’ll just write about these great spots. I’ll also be referencing past posts that I have written about those places in past visits. I have also added a new “button” on the home page called, amazingly enough, “Favorite Places”. Very creative, right? 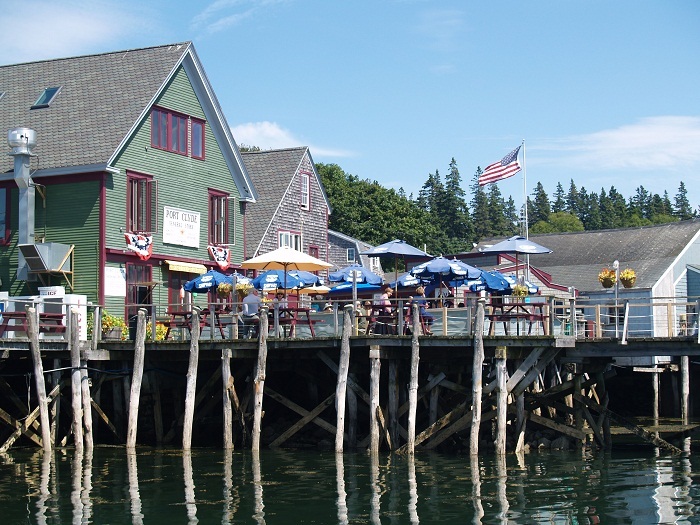 In my last post, “Yes, Bob, I guess you mean the one you wrote almost TWO WEEKS AGO”, (yes, that’s the one) I wrote about Booth Bay Harbor a wonderful place to begin a cruise in Maine. 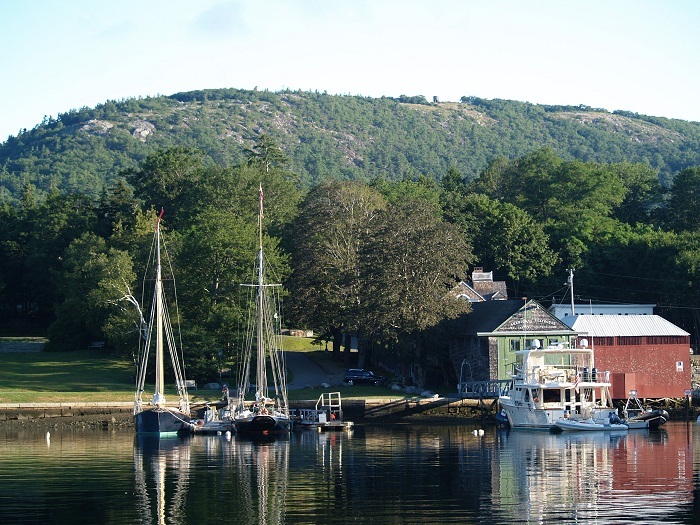 From there we normally head east along the coast to Muscongus Bay, an easy day sail with the prevailing SW winds, to Allen Island, summer home of the late Andrew Wyeth. Along the way to Allen Island, if you are heading east from Boothbay area, there is a great spot, Little Egg Island, that boasts a colony of puffins. These little birds bomb along from the island to sea like little bullets. It’s fun to watch them. This “puffin cam” is not actually on that island but it’s pretty cool. It takes a bit of time to load so be patient. On our last visit to Allen Island we spied his wife Betsy sitting on a bench outside of her home on the island. I wrote about this in a post in 2011, photos and all. Of course, Brenda enjoyed “knitting with Betsy” even if Betsy didn’t know Brenda was “with” her. Well, we won’t be too picky on that point, will we? The island is absolutely beautiful and is reminiscent of a Wyeth painting. The island is a perfect example of what can happen when you combine wealth with good taste, in this case, an “artists touch”. Of the many buildings that make up the Wyeth “compound”, this is one of our favorite. 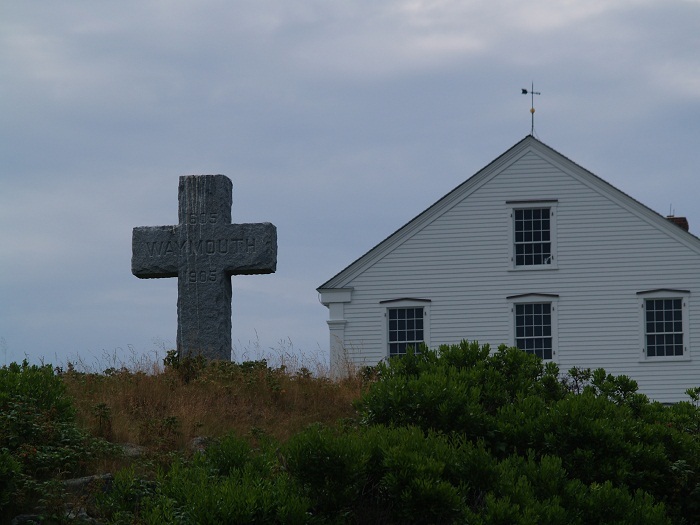 And no, the cross isn’t a family marker, it commemorates the visit of George Weymouth on the ship Archangel, explorer who visited the island in 1605. Interestingly, Weymouth kidnapped a number of local “savages” and brought them back to show off “at court” in England. As you can imagine, they caused quite a stir with King George’s and his cronies. Here’s a link to an interesting article about Weymouth’s visit, “savages” and all. The Wyeth compound is actually made up of two islands, Allen and Benner. There is no landing on the island without the permission of the owners. Sheltered between these two islands is a lovely little harbor where the Wyeth family maintains moorings that visiting boats are welcome to tie up to for the night. It’s a very nice service. On the chart the harbor looks a bit daunting but getting in from either the north or south is easy. Just be aware of the granite ledge to port as you enter from the south. However, it’s well charted and is easy to see. The harbor is protected from all directions and is very scenic. 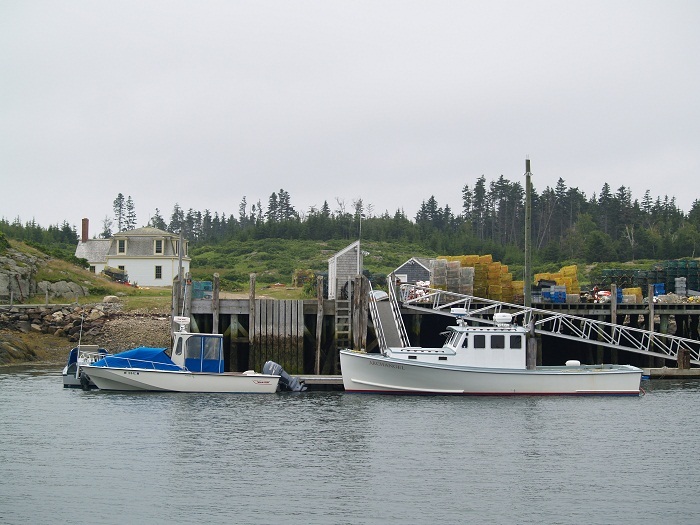 Some of the local lobstermen store gear and their pots on the Wyeth docks. I am sure that they keep the family in “bugs”, that’s Maine lobsterman talk for lobsters, all summer long. The camp maintains (a relative term) several moorings for boaters to use. We have picked up them in settled weather with good results. These moorings are in such a picturesque spot we have used photo on our boat “calling cards” taken here for several years now. Darn but I can’t find that photo. Oh well. Trust me, it’s a nice spot. A nice day trip is to run from Allen Island north to Pt Clyde and then head up through Friendship and west to Hog Island. It’s an easy run and will take you though some of the most scenic areas in Maine. Well, writing about these great spots is making me want to jump aboard Pandora and head to Maine. However, in spite of my recent ramblings about going there, our plans have changed, again. Actually, I can’t stand the idea of missing out on a warm winter. The idea of a New England winter with the cold that comes with that, is a bit of a non-starter for me. 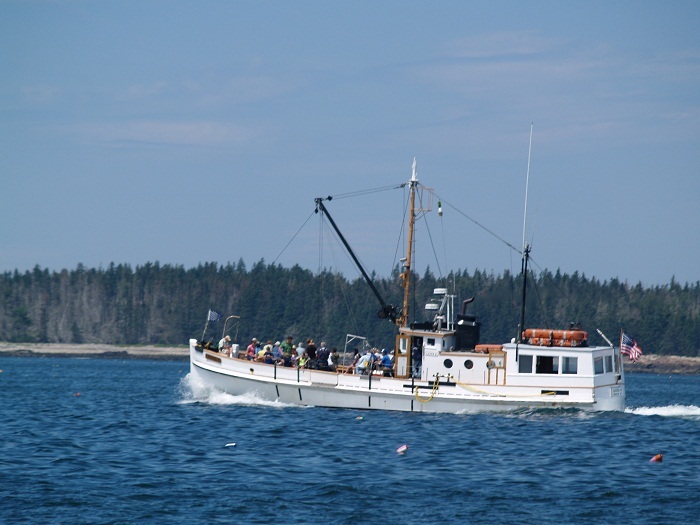 This means that we have scrubbed our Maine for this year and I will again run Pandora south for the winter. I don’t know if we will visit the Bahamas again or if we might try the Florida Keys and Dry Tortugas. That might be fun. Perhaps we can get down there early enough to visit Key West for New Years. I am told that they have a “red shoe”, complete with a resident “drag queen” named Sushi, that drops to the street at the stroke of Midnight. The gay community has a big presence in Key West and, based on this video, they are a group that really knows how to throw a party. Would be a hoot, that’s for sure.Yes, a bit different than the ball in NYC but hey, it’s warm. NYC at 10 degrees or Key West at 80? Hmm… One way or the other, perhaps the best thing about Pandora is that we can take her anywhere we want. For now it’s fun to think about what’s possible and it’s more than possible that we will head south for the winter, details to come. Well, there you have it… A single post that includes sail repair, puffins, ospreys, a classic wooden mail boat and a drag queen video. How’s that for variety? Some might say random is a better description. More to the point, I have work to do on Pandora and the sun is out. That’s all for now.